Oil and gas reserves and resources are volumes that are anticipated to be commercially recoverable at some point in the future. These reserves are located in underground reservoirs, and cannot be readily inspected or quantified with precision. Instead, reserve estimates are made based on the evaluation of data, which provides evidence of the quantity of hydrocarbons present in a given reservoir. Reserve estimators are highly-skilled professionals who utilize their experience and judgment when calculating these volumes, which inherently involves a degree of subjectivity and uncertainty. However, these estimates are necessary in order to determine whether it is economic to develop a discovered field, balancing the projected reserves against the investment required. As outlined in Exhibit 3 below, the Society of Petroleum Engineers classifies reserves into three categories: Proved, Probable and Possible. 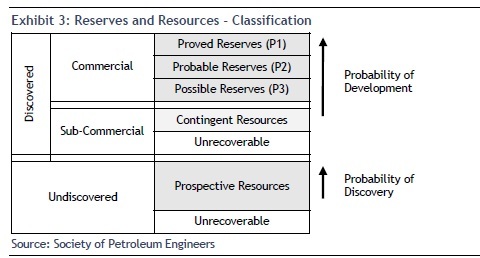 Proved reserves (also referred to as P1 or 1P) are estimated with reasonable certainty to be commercially and economically recoverable given expected prices, operating techniques, and fiscal regimes. The quantity of reserves quoted under this category have a 90% probability of being produced. Probable reserves (P2) are unproven but more likely than not to be recovered, with a 50% probability that total production will at least equal the sum of proved + probable reserves (2P). Finally, Possible reserves (P3) are deemed less likely to be recovered than Probable reserves, with at least a 10% probability of total recovery exceeding the sum of proved + probable + possible reserves (3P). Oil and gas resources have less certainty relative to reserves, since they are not yet technically or commercially recoverable, and can be classified as either Contingent or Prospective. Essentially, existing technology dictates that only a certain proportion of resources can be produced economically at any given time. Furthermore, transportation routes to market are critical because resources may not be commercial if there is no infrastructure in place (i.e., pipelines) to deliver them to downstream markets. Contingent resources have the potential for recoverability, but certain technical or commercial hurdles must be overcome before increasing the probability of recovery. Prospective Resources are volumes that are estimated to be potentially recoverable on the basis of indirect evidence from reservoirs that have not yet been drilled. For resources to be upgraded from the prospective to the contingent category, hydrocarbons must be actually discovered and analyzed further. Oil and gas reserves are used as an objective measure of company value by investors, regulators, and governments alike. Indeed, any abrupt decline in a company’s reserve base would likely lead to material negative effects on its share price. In merger, acquisition, and divestiture transactions, the price relative to the associated resource base is usually quoted as an important metric (please refer to the “Valuation: Trading Multiples” section for more details). Although industry convention may look at proved plus probable (2P) reserves as the best estimate of recoverability from committed projects, an assessment of the total value of a company’s resource base should be comprehensive, including both reserves and resources. E&P companies are also evaluated on reserve growth, the efficiency of replacing production with new reserves, the cost at which new reserves are added, and the remaining life of existing reserves. This is calculated as the reserve base of a given company or field, divided by the annual production from that company or field. For instance, a company with a resource base of 220 mmboe that produces 75,000 boe/d would have an RLI of roughly 8 years. This is a company’s reserve additions for a given year divided by its production for that year. For example, a company that added 30 mmboe of proven (1P) reserves in 2011 and produced 25 mmboe during the same year would have a 1P reserve replacement ratio of 120% of production. If that company added 40 mmboe in proved + probable (2P) reserves, its 2P reserve replacement ratio would be 160% . Reserves can be added through new discoveries, extensions of existing discoveries, and/or improved recovery factors. Acquisitions, dispositions, economic factors and technical revisions can also increase or decrease reserve balances. 1. F&D Costs: Assume Company A spent $5.0 billion on upstream capital expenditures (before acquisitions) in 2011, and added total proven reserves of 100 mmboe and probable reserves of 50 mmboe (both prior to production). Company A’s F&D cost would be $50/boe on a proved (1P) basis, and $33.33/boe on a proved + probable (2P) basis. 3. F&D Costs (including FDC): Further to example 1, assume company A’s future development costs increased by $350 million during 2011. Adding this change in FDC to Company A’s upstream capital expenditures would translate to F&D costs (including change in FDC) of $53.50/boe (1P basis) and $35.67/boe (2P basis). Typically, F&D costs are evaluated on an average basis over three or five years, since capital expenditures and reserve additions can vary widely in any given year. A company may add significant reserves one year without spending much capital, then subsequently spend significant capital over the next few years to develop these reserves (with minimal additions). In this case, the F&D cost would be artificially low in year 1, and artificially high over subsequent years. For oil sands companies, F&D metrics are less relevant since massive reserve additions take place upfront, with the bulk of development capital spending occurring in later years.